The current wave of walkouts demonstrates not xenophobia but an understanding of the consequences for working people of an unregulated labour market during a recession. I'm not trying here to compete with detailed reporting of what is taking place. However I do think all trade union activists need to think through what needs to be done. This is not really about British jobs for British workers, but there is a danger that this will be how the action will come to be seen, including by those taking it. Gordon Brown's unhappy slogan "British jobs for British people" does increase the risk that the racist right will try to take some advantage of the walkouts. A better slogan would be "British jobs on British terms and conditions" or - which we really want - "all jobs on good terms and conditions." The subcontracting of work globally which, underpinned by recent European legal judgments, has helped to trigger the walkouts is but one manifestation of the way in which capital reorganises itself to maximise profit and exploit labour. The workers at the Lindsey oil refinery and those supporting them elsewhere are facing a problem which is not at all unfamiliar to UNISON members. Yesterday I was with a group of low paid social care workers recently transferred from one employer to another to do work which years ago would have been done by directly employed local authority employees on nationally agreed rates of pay. Their work isn't like a construction project where an entire new workforce can be brought in, but they perceive their new employer cutting their hours and treating them badly whilst bringing in staff from another agency to do their work. In the defensive struggles to which this type of offensive action by employers' gives rise there is always a risk of a "them and us" mentality within the workforce, and the responsibility of the Union is to lead action away from that dead end and towards the placing of demands on the employers (and their Government). Our problem isn't with agency workers undercutting rates of pay or with workers brought in from overseas, it is with employers seeking to undercut rates of pay and failing to honour proper terms and conditions. Ultimately it is our job to organise all these workers into a global union movement, but it is also our job to seek to use the collective strength of each group of workers to achieve some joint regulation of the employment relationship and to constrain the ability of management to act unilaterally. The challenge to the trade union movement is to lead the anger that is being expressed around the country at present in an effective struggle to wring concessions from this anti working class Government. The left badly needs a focus for such campaigning and we can't wait much longer for the much anticipated "Peoples Charter". Update - in the mean time can anyone shed any light on the bona fides of this website? Term Limits in trade unions? The agenda for next week's Greater London Regional Council AGM includes an interesting proposal to limit NEC members to three terms of office. On the face of it this looks like a good idea to increase member participation - but it is not at all that simple. UNISON is a lay member-led union by Rule and that means that the people we elect need to be in a position to control and direct the work of senior full-time officials (who are of course appointed on a permanent basis). Who would benefit from term limits on the NEC? It would not be our members. It's good news that there is growing Parliamentary opposition to the proposed part-privatisation of Royal Mail. The trade union movement as a whole needs to take this campaign on and pile on the pressure on the Government Ministers who can stop this lunacy. With the capitialist economy in crisis and popular opposition to Royal Mail privatisation obvious, now is the very last time for a Labour Government to be embarking upon such a stupid policy. Well, I don't know if it's a criminal matter or just a breach of a Code of Practice, but when it comes to members of the House of Lords allegedly offering to lobby for cash payments, all I can say is that I won't be voting for them in the next election! I have written to all UNISON branches in Greater London ahead of my report from the meeting of the NEC Development and Organisation Committee on 22 January because there is one particular matter upon which I need urgent advice from London branches. This report of the work which has been done on the Service Group structures is, in my opinion, seriously deficient. The NEC Development and Organisation Committee will meet on 10 February to consider the responses to consultation on this document and branches who wish to express any views need to communicate these in good time, although the document circulated to branches neglects to mention to whom branches should respond or by what deadline. Any Greater London branches who let me have their comments can be assured that I will pass them on. However I also hope that branches will receive some further information about how to respond as a result of a request made at the Committee meeting on 22 January. The report does not tell you that the earlier comments from both the Health and Local Government Service Groups indicated – in effect – opposition to the proposals now being put forward (certainly opposition to their hasty introduction). Nor does the report point out that the proposals have been supported neither by the National Executive Council nor by the Development and Organisation Committee. The report does not in fact explain very much about what is proposed to happen. The role of sectors will, we are told, be enhanced at the expense of the role of Service Groups, which is problematic since Service Groups are headed by directly elected Committees whereas sectors are generally run by indirectly elected Committees.I fear that indirectly elected Committees are far more vulnerable to manipulation. In the Introduction it is stated that; “The initial consultation exercise with SGEs and relevant sectors – (e.g. FE, CVS) identified a significant level of support for either moderate or high level change. ” However, the Local Government Service Group, representing the majority of UNISON members opposed both these options and the Health Service Group supported neither. The report therefore materially misrepresents the response to consultation. Again in the Introduction it is stated, of the document, that “These proposals set out in greater detail our recommendations on new structures in order that a wider consultation and debate can take place across the union in the period leading up to National Delegate Conference 2009. ” However this document was issued to branches shortly before the Xmas holiday and includes no information upon how to respond to consultation. The NEC Development and Organisation Committee has been called to a meeting on 10 February at which it will have to agree Rule Amendments if these are to be put to National Delegate Conference 2009. This timetable is hardly consistent with a genuine intention to promote debate within the Union. The recommendations of the report have not been endorsed by any lay body of the Union. Although the report was put to the NEC Development and Organisation Committee for approval, the Committee did not approve the report but simply noted it and agreed that it should be the subject of further consultation. The report gives the impression throughout that it is presenting proposals which have some official sanction. This is materially misleading. The report provides that, in respect of the election of sector committees, “the current provision for indirect elections would be replaced by an NEC scheme of options for elections. ” No details of such a scheme are provided. This could threaten democratic lay control of the bodies overseeing negotiations with the employers. The report says of the Service Group Liaison Committee that “the role of this committee needs to be strengthened and developed .” However this is a Committee which is not directly accountable to lay members in any way, and which was criticised by the Local Government Service Group Conference in 2007 for its failures in respect of the dispute over the Local Government Pension Scheme. The promotion of the role of the Service Group Liaison Committee is the promotion of a structure which has failed to defend UNISON members and which fails the most basic tests of democratic accountability. The report states that “The consultation period will allow for full debate on the configuration of sectors to ensure the proposed configuration will allow sectors to develop as proposed. ” As there has been no serious attempt to allow for a consultation period – branches not having been advised or encouraged to respond to these proposals, this simply has not happened. The report states that; “All bargaining groups will be on an equal footing regardless of size so that their relative influence will be proportionate. ” This is nonsensical. If influence is to be proportionate then larger groups must have greater influence and if all groups (whether representing 1,000 or 100,000) are on an equal footing then their relative influence cannot be proportionate. There are arguments in favour of each approach, but the fact is that this report suggests that both conflicting approaches can be accommodated at once when this is clearly impossible. This is a very poor piece of work. The report asks “Are these proposals set in stone?” The answer is that they cannot be as they have never been endorsed by any democratic elected body of lay members. There is no doubt that we need to review and revise our structures. However we would be doing our members a disservice if we were to endorse these ill thought-out proposals, which have the sanction of no elected body within our Union and offer no demonstrable benefits to any of our members. I hope that Branches in Greater London will now take the time to comment on this document, whether you agree with me or its authors (or neither!) and that you will insist that the important question of the future structure of our Union should be decided by our members in our branches and workplaces. I am not conservative about UNISON's structures. I would countenance the abolition of almost any part of our structures (excluding branches, Conference and self-organised groups) if it could be shown that this would make our Union more effective. However, I am not in favour of our allowing the admittedly ramshackle nature of our existing structures to become an excuse for empowering the National Executive Council to change these structures on the basis of such a deeply flawed report. Navel-gazing about our national structures is much less helpful than using the new branch assessment process to focus on making our existing structures work for our members. I am, as the bit up above on the blog makes clear, a member of the Labour Representation Committee (the rank and file organisation for socialists within the Labour Party). I get some stick for this from time to time from those on the right-wing who don't understand the importance of socialism and from those on the left who don't understand the workers' movement but I am happy with this affiliation. This evening was a good example of why the LRC has a valuable role to play as I spent it at a working group of LRC activists organising the LRC's support for the campaign of LRC affiliate, the Communications Workers Union (CWU) against the Hooper report proposals for the part privatisation of the Royal Mail. Or, as they should be described, the Mandelson proposals for the part privatisation of the Royal Mail. But would you want to dip your bread in an egg that was good in parts? Hooper is about driving Royal Mail out of the public sector and it needs to be vigorously opposed. Fighting privatisation is hard. The CWU have a proud record and some good victories in the past but now is no time to be complacent. The trade union movement is full of defeatists who think that all we can ever do is to accommodate to the changes around us and who are prepared to tolerate privatisation if they think they can secure recognition with the new private employers. UNISON policy is clear. We oppose privatisation and we must oppose this privatisation. The CWU can win again but this is a job for the whole labour and trade union movement. A note much later than this post (on 12 May 2009) - I have removed a link from the post because it caused offence. Privatisation of the Post would cause even more offence! Of course any ceasefire - however poorly observed - is almost inevitably better than the absence of a ceasefire. In general the fewer people who are killed the better. However, as today's Morning Star points out, an Israeli ceasefire does nothing to lift the siege of Gaza or to resolve the problems underlying the conflict. First among these must be the illegal Israeli occupation of Palestine. I hope that the mobilisation in support of the Palestinians which we have seen in the trade unions in recent weeks can now be sustained. We need to raise funds to meet the pressing material needs of the people of Gaza - and to sustain the political pressure on our Government, and those of the European Union, to isolate Israel whilst the occupation continues. Regular readers (Sid and Doris blogger) will be aware that I am a Labour Party member. I don't often post links to papers published by supporters of other political organisations. However this week's Socialist Worker puts clearly into the public domain some shocking news connected to the case of my friend and former UNISON NEC member Yunus Bakhsh. Follow the link for the full story, but it here's a precis. Yunus faced disciplinary action from both his employer and trade union as a result of allegations of bullying. In his defence Yunus suggested that the complaints may have been motivated by racism. This argument was, as I understand it, disregarded. Now it has come to light that one of his accusers appears to have been "Facebook friends" with far right activists and to have actively joined racist groups on Facebook. Furthermore there are indications that the British National Party had inside information on the case against Yunus. I understand that UNISON is investigating these revelations and I - and I am sure other NEC members - shall certainly ask for a thorough investigation and regular updates. The legitimacy of the disciplinary action taken against Yunus must be called into question by this news - particularly in the absence of any explanation for the information which has come to light from the complainant. I am proud to be a UNISON member - and one of the reasons I am proud of this is that I believe wholeheartedly in the sincerity of our commitment to fight racism in general and to confront the far right in particular. We must now find a way, in this particular case, to live up to UNISON's best traditions and put right an injustice. The National Committee of the Labour Representation Committee met today. It elected an Executive Committee (the candidates I supported had the luck that is so often associated with that support and were defeated). The major item for debate was - of course - the economic crisis. We agreed to campaign around the need for a socialist response to the crisis - backing the "Peoples Charter" which is still being drafted in drawn out secret horse-trading on the left. Whilst the Charter will be fairly vague and general, and its genesis is (perhaps unavoidably) in the worst tradition of (no longer) smoke filled rooms, it will be a positive and progressive development. All socialists need to unite around certain core demands for which we need to win mass support in the labour movement and the working class. Central to these demands is probably the real and meaningful nationalisation of the major banks under democratic control. I hope that the proponents of the Charter make real headway towards the ambitious goal of a million signatures, but I also hope that the demands that will be reflected in the Charter will also be taken up and adopted by trade unions and Constituency Labour Parties. There were a number of other debates this afternoon, though none of such immediate and central importance. One critical campaign for the coming months will be to oppose the "Hooper Report" proposals for the privatisation of Royal Mail. These proposals pose an existential threat to the CWU and also probably to that Union's affiliation to the Labour Party. Privatisation of the Royal Mail would be a massive defeat for the working class and a full scale assault on one of the bastions of trade union strength in the economy. It is a stupid and unpopular proposal which will win the Labour Government neither friends nor votes. The LRC will be to the fore in resisting this attack - and I hope that UNISON branches will get behind our CWU comrades in defending one of our oldest public services. A number of other proposals for campaigning activities were discussed. I hope to go on to report on their success in the coming months. UNISON has so much potential and so much promise. We, as UNISON members, could achieve so much. In the past year it was the line of the UNISON leadership which prevented an effective joint public sector struggle over pay. In the years before that it was UNISON's leadership who prevented active unity over public service pensions. I know this because I have been (a minority!) part of that leadership which has so let us down. Let us now fight for a leadership for our wonderful trade union which deserves our excellent membership. Parenthood is the scariest thing I have done in my life.If you are both a parent and honest (remember the kids aren't listening!) then I bet you think that too! One consequence of parenthood is that we are prone to describe the conduct of others (as appropriate) in ways which really fit the behaviour of our children. Today I learned that a member of a tiny ultra-leftist clique on my Branch Committee views me as a dangerous animal. The depth of the compassion which I feel for that person cannot be expressed in a way that is not patronising. But I am ok with patronising those who deserve it! In the mean time trade unionists know that we need to support one another. And we do. The Annual General Meeting of UNISON's Greater London Regional Council is almost upon us. Wednesday 4 February is the date in question. All those who believe that our Union should be led by lay members who take their lead from the membership (rather than the office) must ensure that our branches turn out their full voting delegation on 4 February. In this report to the Regional Council Annual General Meeting I will deal with just a few of the main issues which have arisen in the past year. Branches who want more information can contact me at j.rogers@unison.co.uk or on 07957505571. I am happy to attend branch meetings as are my NEC colleagues. The past year has seen a further fall in the living standards of UNISON members as our pay campaigns failed to deliver increases which match the rising cost of living. The National Executive Council (NEC) does not exercise real authority in our Union, and particularly not in relation to “service group” issues, where individual service groups have some autonomy and the (generally unaccountable) Service Group Liaison Committee holds sway. General Secretary Dave Prentis began the year committed to a “sector by sector” approach to building the unity of public sector unions to fight on pay. However, in the light of the experience of the past year he has now agreed (in response to questions at the NEC) that this approach did not deliver the goods. Had we been able, at least, to unite those who took action on pay in April 2008 with those who took action in July we might have done better. We struggled to mobilise members to take action over pay when they did not believe that the Union had a strategy to win. I hope that we will learn the lessons of the pay campaigns of 2008 in facing up to the threats to jobs and pensions in 2009. We need to build united action with those who are willing to take action and we need to accept the harsh reality that this Government is our enemy and not our friend. The NEC has received regular updates in relation to the Local Government Pension Scheme. There seems to be little prospect that members in England will benefit from extended protection of the “Rule of 85”. Less satisfactory arrangements for medical retirement have also now been imposed. Tory attacks upon public sector pension provision indicate that we will need a united front to protect all public service pensions in the coming year. Much of the time of the NEC (and of our senior national officials) has been taken up with equal pay litigation during 2008. There are serious limitations upon what can be reported because of the eagerness of “no win no fee” solicitors to encourage legal action against trade unions. Case law has developed in a fairly damaging way during the course of the year as a result of judgements in the Allen and Bainbridge cases among others. 2008 saw the election of a BNP representative to the Greater London Assembly. 2009 threatens us with the prospect of BNP members of the European Parliament. UNISON has been (and must remain) in the forefront of fighting the far right. I have received information which suggests the presence within UNISON (in another Region) of sympathisers with BNP politics. I have raised this with our General Secretary and have been assured that this is under investigation. It has been reported to the NEC that we now have legal advice which suggests that we can take action to exclude active supporters of far right organisations from our Union. I was very pleased that Conference agreed last year that there should be a review of the democracy guidelines within our Union (and that Conference affirmed the right of branches to campaign for their own policies in national ballots!) This will continue to be a live issue in 2009 and members who believe that our Union must and will continue to be lay led will need to pay attention to developments. Conference last year agreed a review of the operation of our political funds and the NEC has agreed that this will lead to a report to Conference in 2010. In the mean time branches may wish to prepare for the consultation on this review – it was very clear from the vote on reprioritisation of motions at last year’s Conference that there is widespread dissatisfaction with the manifest inadequacy of our political work at present. I was very pleased that the NEC agreed a positive and progressive statement about the economic crisis at its meeting in October 2008. I was disappointed that the majority of members of the Regional Committee failed to understand UNISON’s policy when agreeing their position on motions to the (regrettably inquorate) Regional Council meeting in December. The failure of unregulated capitalism makes the case very dramatically for public provision of public services. 2009 could be the year in which socialist politics are adopted by the trade union movement – if we have the confidence to advance them. I wish all Regional Council delegates a Happy New Year in spite of the problems which we know we will face in 2009. I realise that the Regional lay leadership and their supporters on the Regional Committee have supported the failed approach to pay campaigns in 2008 and are pleased with UNISON’s work in the Labour Party and that they will therefore disagree with the tone of this report. You, as a delegate to the Regional Council, have a choice about who will lead our Union in 2009. If you disagree with me you know what to do. The latest rubbish from the third in line to the throne reminds me of just why, for as long as I can remember the capacity for thought, I have been a republican. New Labour began claiming all sorts of "modernising" credentials, but the most elementary modernisation of the British state was, of course, beyond them. The Prime Ministerial patronage which reduces the Commons to bovine complacency rests on the sovereignity of the crown in Parliament, so the abolition of the monarchy is, and remains, an important demand for socialists and trade unionists. That said, criticising the lazy and stupid racism of an unappealing member of the aristocracy (with or without royal blood) is hardly demanding or cutting edge criticism. The ignorant casual racism of the Prince is the tip of the iceberg of everyday racism in our society. Racism in the workplace is a daily reality for our members - and we must all be able to look to UNISON representatives to stand up against that racism and to represent our members. It would be very much worse in some ways - and more relevant to our immediate concerns as trade union activists - if a UNISON representative, particularly one trained by our Union and therefore familiar with our strong anti-racist policies, were to associate openly and in public with racists views and their adherents. That would be a very serious matter and complaints which were made about it would need to be treated with the utmost seriousness (whoever made them). I was really pleased to see a better number of UNSION banners on yesterday's enormous demonstration in solidarity with the Palestinian people. 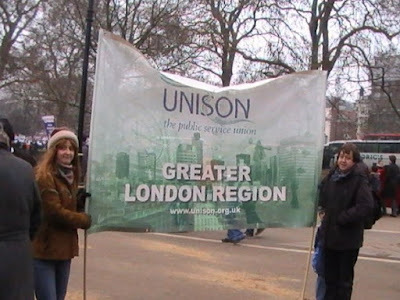 UNISON's President and General Secretary were both there with the national banner - and the Greater London Regional banner was carried by a number of Regional activists (and friends and family). A particularly honourable mention goes to Jean Geldart for taking custody of the banner at the end of the demonstration. With the attacks on Gaza intensifying we need to step up political pressure on the Government. Building on UNISON's existing policy we need to call for an end to diplomatic relations with Israel until their guns fall silent, and - now - we need to build an approach to economic and cultural boycotts which can defeat zionism as we defeated apartheid. I am very pleased that UNISON is supporting the Palestinians in the face of Israeli military aggression. It’s excellent news that the Union has made a donation of £10,000 to Medical Aid for Palestinians and is encouraging branches to make donations. I hope that the Lambeth Branch Annual General Meeting next week will agree a donation, and also that a decent number of branch members will attend Saturday’s demonstration. The national UNISON banner will be at Hyde Park on Saturday as will the Greater London Regional banner and – I hope – many branch banners. We need to demonstrate that millions of trade unionists in the UK are on the side of the victims of aggression and that we stand for peace. See you there? I was pleased to be able to be among the tens of thousands who demonstrated in London yesterday against the attacks on the people of Gaza. I was particularly pleased to be asked to help carry one of the few trade union banners on the demonstration, the banner of the Kensington and Chelsea local government branch of UNISON, which we then took home to Kensington for the protest outside the Israeli embassy. The disregard shown by the Israeli military for the humanity of the Palestinian people and the lack of concern shown by the leaders of the Western powers challenge all trade unionists to respond. UNISON has called upon our members to support protests against the attacks on Gaza. The Palestine Solidarity Campaign are organising regular protests, and the website of the Stop the War Coalition confirms what was announced yesterday – that there will be a march on the Israeli Embassy next Saturday, 10 January. In the next week every UNISON branch should dust off its banner and organise delegations to support next Saturday’s demonstration. I hope and expect to see the national banner there too. Elementary internationalism – in line with UNISON Conference policy – calls for an immediate end to Israel's military assault on Gaza and an immediate end to the blockade and siege on Gaza. Our task is to put pressure on our Government, whose “even handed” response to this grossly uneven battle amounts to tacit support for criminal aggression against the Palestinian people. I have ignored this poor blog for a fortnight whilst I have rested and recovered from a trying year. As you might imagine I am focused on what is coming up in UNISON. In a little over four weeks the Annual General Meeting of the Greater London Regional Council will have the opportunity to elect a leadership committed to democracy and lay control by supporting the slate headed by candidate for Convenor, Malcolm Campbell. Over the next month or so candidates will also be seeking nominations for the forthcoming elections to UNISON's National Executive Council. I'll be seeking nomination again - and hoping that enough real socialists are elected to make a positive difference to the direction of the Union. One of these days I'll compose the blog post which needs to be written to pose the obvious question to supporters of the Morning Star about what their approach to UNISON is. It's good to be in a Union which takes the right line about Palestine and Cuba, but a radicalism that comes to life thousands of miles away (or hundreds of years in the past) doesn't deliver the goods on pay or pensions. While there will be democratic choices for members to take at Regional and national (and branch) level, in the mean time work will carry on on the review of Service Groups (which needs careful attention from the rank and file) and on the reviews of UNISON's democracy guidelines and political funds. I'll blog here about these soon.